UK | Can you Crack the Code for Your Next Job? 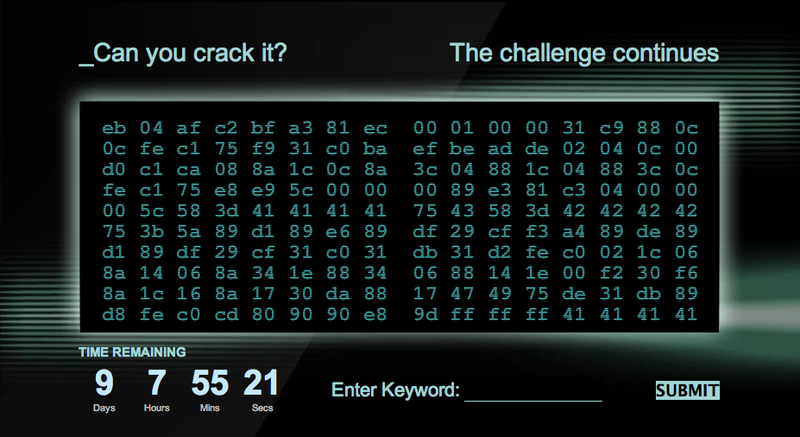 UK intelligence agency Government Communications Headquarters (GCHQ) decided to go beyond the usual recruiting techniques by launching a code-cracking competition. Potential applicants will have to crack the code presented on an (unbranded) website: if they are successful they will be redirected to the agency's recruitment website. The campaign was spread also on social media outlets. People who have already hacked illegally won't be eligible, though, reports BBC while reporting the organisation's declarations. The competition will last until December 12th. Last month we wrote about OpenCamera, an informal group of Deputies that had started tweeting on the happenings of the Chamber of Deputies. In these past few weeks several local councils all over Italy followed this example. La Macchina del Fungo (Italian for "The Mushroom Machine"), an online lab focused on politics and journalism, has published Open Tweet, a map that traces all these attempts of opening politics. There are only two regional councils listed so far, Lazio (the region with Rome) and Lombardia (the one with Milan) but several city councils, including cities in Sicily and Sardinia. Other examples of the lab's work include a list of tweeting politicians (more than 200 so far), parties and journalists (another category that has just found out about Twitter, apparently). The name of the lab, coordinated by techjournalist Mauro Munafò, echoes "La Macchina del Fango (in English: "The mud machine"), an expression that recently became widely popular in Italy to describe false news spreaded in order to deliberately attack a person. The Nominet Trust is providing funding for a set of 10 ‘data-days’ with a range of UK Charities – more details of our offer to Charities can be found here. We’re looking for Open Data experts to match with these Charities: ideally we’re after a combination of experience of building open data applications and working with civil society organisations. [...] Tim Davies from Practical Participation has kindly put together some helpful guidance for Charities (see below) on how they might best use an ‘open data-day’: this is also intended to give you a good idea of what the role of the open data consultant may involve. How can open data make a difference to the charity sector? Read more on the OKFN blog. Data on party group, committee and delegation meetings, transcripts: a Parliament open data list created by Bulgarian blogger Boyan Yurukov. And there's more to come, he promises. It's (almost) Christmas time: check mySociety's special Advent calendar!